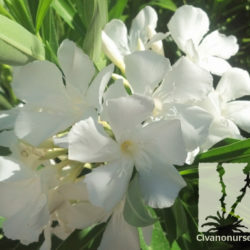 If you want an evergreen shrub with colorful flowers, but like to save water, then Oleander is the perfect plant for you! Once established, they are among the most drought tolerant flowering shrubs on the market, and with so many different colors and forms available, it’s easy to find the perfect one for your garden. 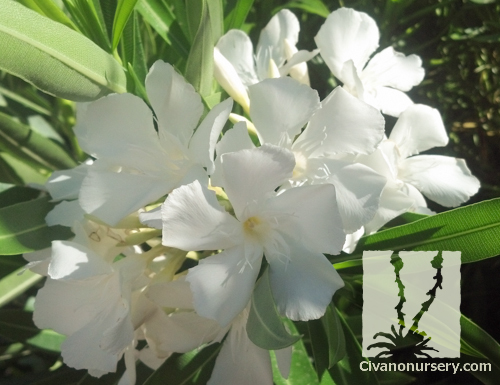 Evergreen and extremely fast-growing, Oleander makes an excellent screen, unclipped hedge, or space definer. 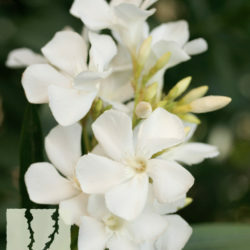 ‘Little White’ is a dwarf variety that is easily kept at six feet tall, bearing pure white flowers from spring through fall. 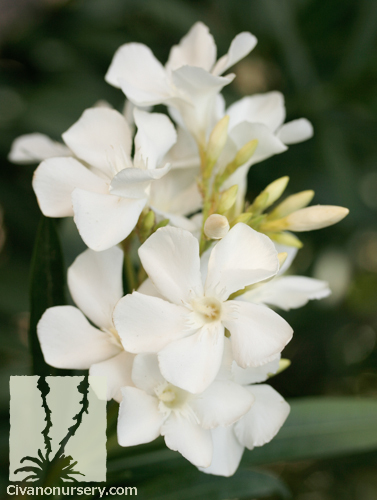 This cultivar is perfect for growing in containers or in the ground, near patios or entryways, and in reflected heat.